When you are looking for a quick yes or no answer and are uncertain which way to go, muscle testing offers easy access to your Inner Wisdom. When you use muscle testing to identify your inner truth, you make decisions you can trust. -When something is true or right for you, your muscles remain strong. This is a yes. -When something is not right for you, your energy weakens and your muscles give way. This is a no. How do you muscle test? You muscle test by exerting firm, gentle pressure on a muscle. If the muscle resists, the answer is yes. If it gives way, the answer is no. It’s as simple as that. Another person can help you muscle test by pressing down on your outstretched arm. If your arm holds firm, you are getting a “yes” signal. When the arm releases, a “no” is indicated. You don’t need someone else to muscle test. You can use your hands to muscle test yourself by. Make a circle by touching the tips of the thumb and pinkie of your left hand together. 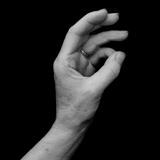 Then slip the thumb and index fingers of your right hand up through the circle from below. Open up the fingers of your right hand to press gently but firmly on the circle. If the circle holds, the answer is “yes”. To get a feel for a yes and a no, simply state something that you know to be true of yourself and muscle test it. Notice how it feels when your fingers hold firm. Then state something you know to be false for yourself and muscle test that statement. Notice the difference between how your muscles respond to this statement compared to the one before. Let’s say that you are a married man named John, living inChicago. You can say “I’m a man,” and then muscle test. You’ll be able to feel what a firm “yes” response feels like. Then say “I am a woman.” You’ll notice the difference when the circle of your fingers breaks open under the pressure you are exerting. Try again with “My name is John.” Notice the strength in your fingers as they hold firm. Then say, “My name is Mildred.” Again, notice how it feels when the fingers of your left hand give way. You can experiment with getting the feel of it for as long as you need to. Try “I live in Chicago,” then, “I live in Tahiti,” or “I’m married,” then “I’m single.” As you practice with a series of statements such as these, you will become more tuned in to how “yes” feels and how you experience “no”. Once familiar with this technique, you can use it to replace uncertainty with clarity in any yes/no decision you need to make. There was a period of my life when I was working on releasing excess weight. One habit I knew I needed to change was my tendency to go into a bakery and buy myself a little treat whenever I was down, or felt I deserved a reward. I decided to use muscle testing to help me. Whenever I entered a bakery, instead of immediately walking up to the counter and buying that éclair or mini apple tart, I stood still. Silently I asked myself, “Should I get that yummy éclair?” Then I muscle tested. When I came up with a “no”, I’d ask about the tart. “No” again. Thinking that a bran muffin might somehow be more virtuous, I’d ask about the bran muffin and muscle test again. With the third decisive “No,” I’d walk out without buying anything. I knew my Inner Wisdom would always guide me right. By trusting that guidance, I empowered myself to resist temptation and achieve my weight release goals. Ultimately, I stopped going into bakeries. I found other ways to console myself when I was unhappy or reward myself when I deserved it. Muscle testing will give you clarity to determine what’s right for you in any situation. By consistently aligning with your Inner Wisdom, you’ll make better decisions that will help you live a better life.